WHAT IS ICH a.k.a WHITE SPOT? Goldfish encounter a common disease named ich , also know as white spot disease which caused protozoan parasite. It is round, covered by cilia (hair-like extensions), and about 1 mm in diameter and so visible to the naked eye. You can obviously see white spots on the infected fish. The parasite penetrates the skin surface of the goldfish and feeds on its tissue and blood.The fish will be ill, with fins held close to the body, and you probably will see the fish flashing off of the object in the tank trying to dislodge the parasite. If the gills are affected your fish will gasp for air. After a few days of feeding on the fish’s blood, the parasite will leaves the host and forming a cyst in the tank. Once the reproductive stage complete, about 1000 juvenile parasite are released. These are much smaller than the adult stage and are not visible to the naked eye. This free-swimming form then seeks out a host, burrows into their skin, and the whole cycle begins again. In addition, because of the small size of the free-swimming stage, they are easily able to enter the gills of the fish. 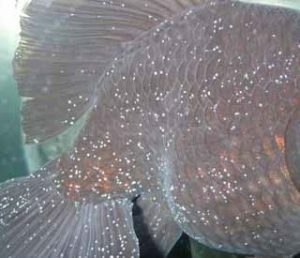 By the time you find white spots on the fish’s fins and body the gills are usually already heavily infected with ich. The speed of this cycle depends on water temperature. At 24-26 degrees Celsius the entire life span about four days. Higher temperature may speed up the life span of the parasite. Pet store goldfish that is not quarantine that carry the parasite. Tank that seldom have a water change may cause accumulated toxin which harmful to the fish’s immune system. Small pinhead size white spots that form on the fins and body. They are more easily seen on dark colored fish but are obvious when they start appearing on fins of lighter fish. First of all, raise the water temperature gradually to 30+ degree celsius using a aquarium heater and this action will speed up the life span of the parasites . so , it will leave the goldfish quickly . High temperature is too hot for to juvenile parasite to survive. Non-iodized salt is the cheapest, most effective and safer for your tank. Do a 50% water change to ensure optimal water quality during the treatment. Dissolve 1 tsp of non-iodized sea salt in a cup full of tank water. Pour slowly around the tank, and 2 times a day for continuously 3 days. This will ensure that a 0.3% solution is maintained. Between each treatment, perform a 25% water change to remove fallen packets of the ich parasite from the bottom of the tank. I tried on the combination of mild salt with Malachite Green or Methylene Blue . It both works for me . When all cysts have disappeared after a few days,do a 50% water change without adding any chemicals. Make sure the water temperatures are the same.